Dewalt Heavy-Duty 14.4V Cordless Light Gauge Steel Framing Screwdriver Kit. VERSA-CLUTCH® torque adjustment system to "dial" the proper torque needed to efficiently drive fasteners without stripping or breaking fastener. 0-800/0-2,300 rpm for better fastener control in various material thickness. 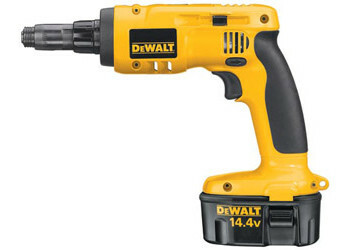 First cordless tool designed for steel fastening applications that is ideal for use in 12-28 gauge CRS. Not for use in "Red Iron" or structural steel.